The Pacific Northwest is fern country. Our forests are literally carpeted with them. If you enjoy native plant gardening like I do, take a look at the Deer Fern (Blechnum spicant). 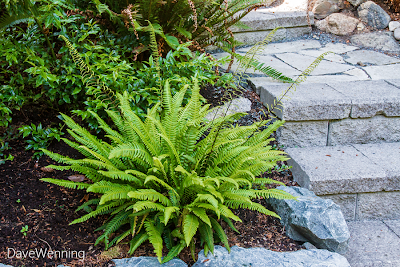 Ferns are associated with shade and damp conditions. I have a lot of shade, but my glacial soil and Rain Shadow location can be hostile to moisture-loving plants. When I spotted some Deer Ferns at the Ace Hardware nursery in town, I decided to to try one and see how it fared. I planted it in a mostly shady spot at the northwest corner of the house. It gets some mid-afternoon sun and a little watering, but the sandy, rocky soil is always pretty dry under the bark mulch. Nevertheless, it seems to be thriving here. I planted it in early spring, and it has since doubled in volume. It has also sprouted fertile fronds. The bolder fronds growing in a rosette from the base are sterile, i.e. they produce no spores. The taller, thinner, lacier fronds growing above the main plant bear the fertile spore-producing leaves (right-click the photo to see the full size image). Unlike seed plants with flowers, ferns have a two-stage reproductive cycle. First the spores grow into an intermediate plantlet called a gametophyte or prothallus. Then, the gametophyte produces egg and sperm cells. In the presence of moisture, the sperm cells migrate to fertilize the egg cells and grow into the adult fern. A more detailed discussion of this is here. 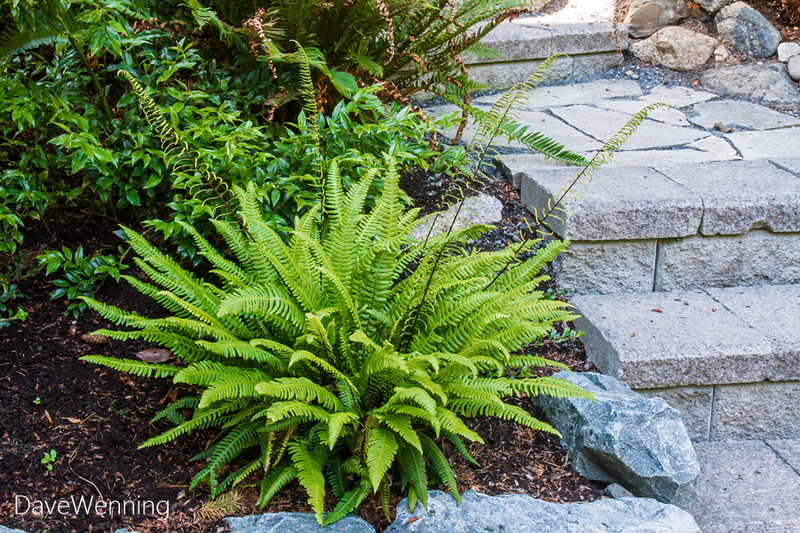 I like ferns because they add a beautiful architectural quality to the garden. Most native varieties are not demanding or fussy plants and require very little care. Evergreen species might need a little pruning of the dead fronds in the fall if you don't care for the look. Once established, they are surprisingly drought tolerant. Mix them in with shrubs like Rhododendrons, Red-flowering Currants, small Vine Maples and Evergreen Huckleberry. Sword Ferns do very well planted around the bases of mature Douglas Firs, where other plants might struggle. Because of the success of this trial plant, I intend to add more Deer Ferns to the shade garden this fall. They will join my indigenous Western Sword Ferns and Lady Ferns, and the Wood Ferns already growing in the yard. I love deer fern, haven't tried to plant. I have some sword ferns that came up with some salal I transplanted. And lots of lady fern, grows like a week.